The latest Diesel cigar is a single-vitola limited edition with a price tag that belies its quality. With more and more cigars moving toward the $20 and up range, it’s a pleasant surprise to find one this large and this good for only $10. Hair of the Dog is a lightly pressed, toro-sized (6 x 54) smoke with a smooth, golden brown Ecuadorian Sumatra wrapper around an Ecuadorian Habano binder and Nicaraguan filler tobaccos. Sweet hay dominates the pre-light notes. While the cigar, overall, is in the medium-strength range, it begins with a strong pepper blast reminiscent of some of Don José “Pepin” Garcia’s early smokes. That tapers off after the first few puffs. Other flavors along the way include cashew, white pepper, toast, a bit of cinnamon and, in the final third, a little licorice. The cigar’s performance was tops in all respects. The burn was sharp and even, the ash held tight, smoke production was voluminous, and the draw exhibited just the right amount of resistance. One small complaint: The paper bands, sporting the distinctive lower-case “d” that identifies the brand, were glued so tightly that removing them became quite a chore. The cigars are rolled at A.J. Fernandez’s factory in Estelí, Nicaragua. The original Diesel was one of the cigars that helped Fernandez rise to prominence through its initial sales by online/catalog giant Cigars International. The line—and its availability—has been expanding. Last year, for example, saw the release of the Diesel Whiskey Row that incorporated tobacco aged in Rabbit Hole Bourbon barrels. 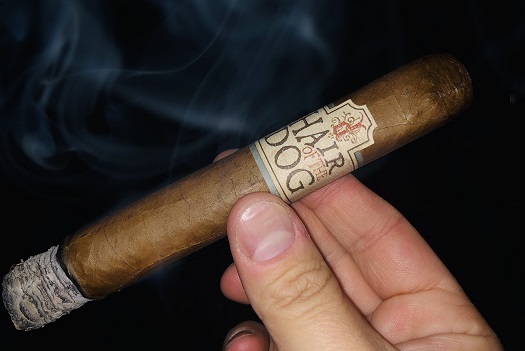 Hair of the Dog is a production with General Cigar (part of the same conglomerate that owns Cigars International) and that guarantees wide release, even with the limited-edition production ceiling. The name is a bit hard to fathom. Using a phrase that commonly refers to having a day-after drink to ward off the effects of a hangover seems pretty far removed from tobacco. But in these days of odd monikers and trademark lawsuits, I suppose we shouldn’t be surprised by almost any cigar name. If you see one, give it a try. I don’t think you’ll be disappointed. Hair of the Dog checks in at four out of five stogies.